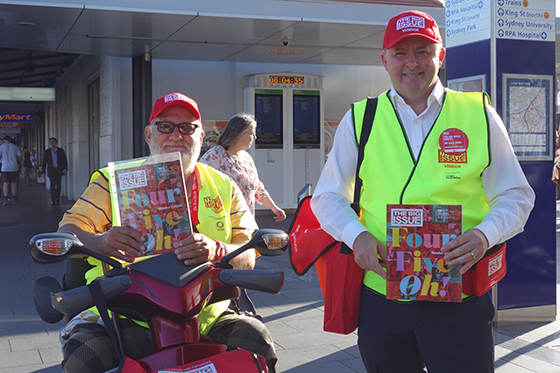 Today I have the privilege of joining Big Issue vendor Alan at Newtown Station as part of the International Street Paper Vendor Week, shining the spotlight on poverty and homelessness. This is an important week that highlights the work of the 28, 000 people who sell papers in 40 countries around the world each year, helping to breakdown stereotypes of the homeless and marginalised in our communities. Here in Australia The Big Issue gives homeless people an opportunity to connect with others in their local community and I am a strong supporter of this cause. In Australia, the aim is to put $100,000 into vendors’ pockets by selling 33,333 copies of The Big Issue during the fortnightly edition which coincides with Anti-Poverty Week. I encourage people over the next week to stop for a chat with their local vendor and consider purchasing this fortnight’s edition. Since its launch in 1996, more than 4500 vendors have sold The Big Issue magazine in Australia and circulation has nearly quadrupled.